It has been four long years since Outloud released any new material, their last album being 2014's 'Let's Get Serious'. I am pleased to report that they now charge back with fortitude and present us with a pithy set of new songs which illustrates how they have only gotten better during those dormant years. This album masterfully blends Melodic Rock and AOR with elements Europop, and while this combination seems like a dubious amalgamation of styles, it all works very well. 'I Am The One' has a rhythm not far from being full-on danceable... think classic Europop artists like Felix and Snap! (who experienced heavy rotation in the nineties), whereas 'Share My Dreams' is an impressive power ballad that is every bit as good as the stunning 'We Own The Night' from Treat. Outloud then follow this with a lush, AOR-injected composition entitled 'World-Go-Around', its propulsive rhythm and keyboard-executed saxophone solo gesturing pleasantly to those glorious days of eighties West Coast AOR. Furthermore, the three-note descending melody is almost a complete facsimile of TNT's classic 'Tonight I'm Falling'. The song's verse melody also rings similarly to that same TNT classic just before launching into more of that bouncy, Europop feel which supports a wonderfully bombastic chorus. 'Fallen Love' is a gentle A Cappella moment that will bring to mind 'Just Like I Planned' from Harem Scarem's classic 'Mood Swings' record. Not only that, it also occupies the same penultimate track position and sets up the closing all-out rocker 'Fight On!' which will make fans of old-school Stryper feel all warm and fuzzy. The album's opener, 'Fool's Train' and the later appearing 'Live With It' stand as this release's heaviest tracks, but they still maintain the same lively and upbeat attitude as the rest of the album. The extended wait for new material from Outloud was well worth it. A lot of comparisons can be drawn to those who came before, but Outloud are by no means clones. Not only do they pull bits and pieces from many respected albums and bands, they deliver it in a way that is fresh, unpretentious, genuine and sincere. 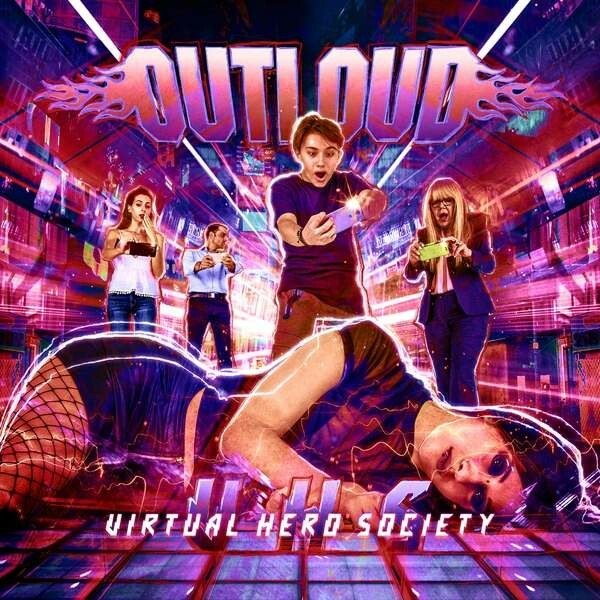 'Virtual Hero Society' (and yes, the title's acronym is a nod to that antiquated technology) will clearly continue the band's popularity among existing fans and is poised to garner legions more. Every song is worthy of inclusion and essential listening for fans of Brother Firetribe, Leverage and Treat.